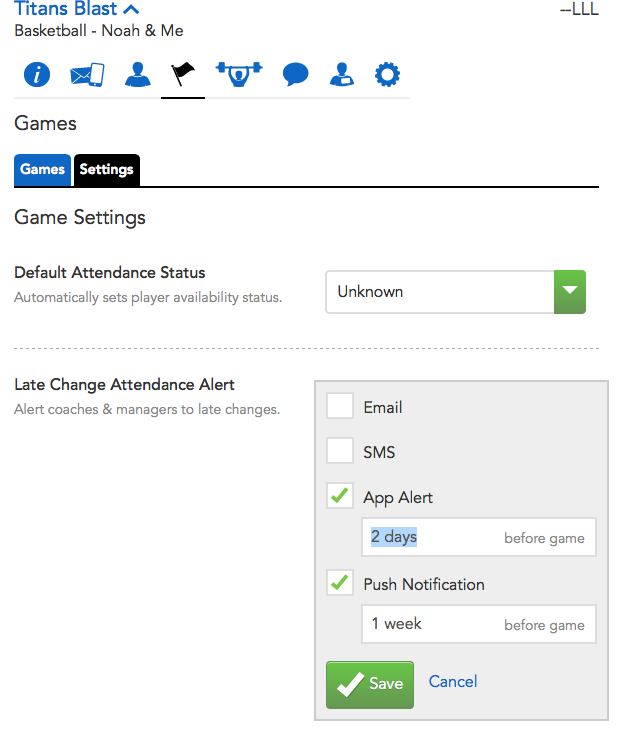 Teamstuff has a terrific system for letting coaches and managers know about those last minute drop outs. It's called our late change attendance alert, and it has lots of ways of letting you know something's happened. You can use those options to turn it on 'loud', or have it 'quiet' - or not at all. For example, you might want an email if the player's dropped out the day before a game, but you want an email AND a push notification if it happens 2 hours before the game. It's pretty powerful. The settings are team wide - so all managers and coaches on the team get the same notifications. 2. Navigate to your team, and click on the games listing. 3. There's a settings tab shown - click on this. 4. You should see the settings for your late change alert, and click on the pencil icon to edit them. It will look like the following screen. So adjust then anyway you want them, hit save and you are done.